For the last three years, FilmL.A. 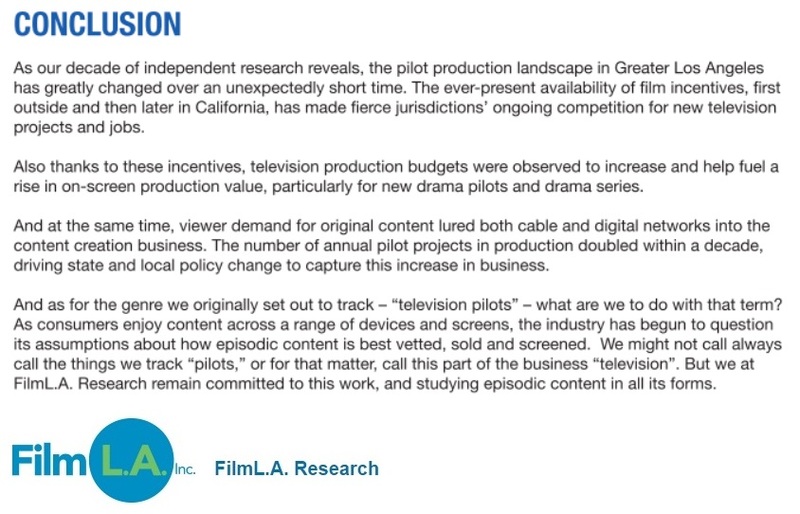 Research has endeavored to track the movies released in 2013, 2014 and now 2015 to determine where they were ilmed, why they ilmed in the locations they did and how much was spent to produce them. 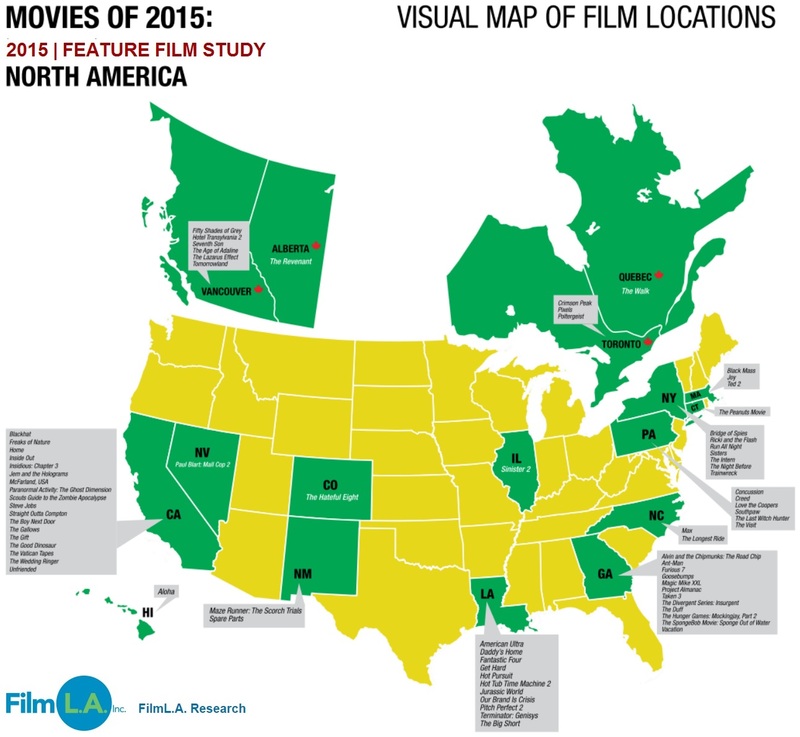 The 2015 Feature Film Production Study follows the same methodology and tracks the feature ilms released theatrically within the U.S.1 during the 2015 calendar year. 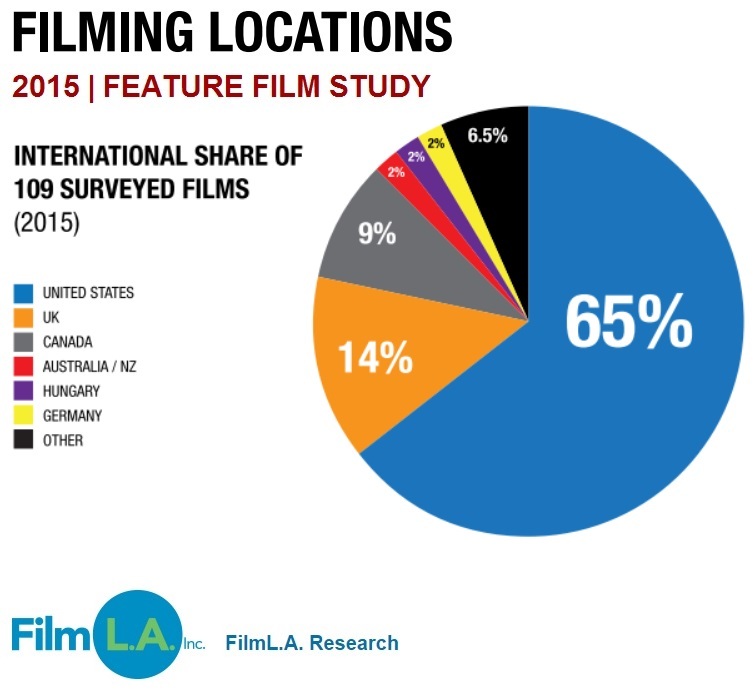 Where possible, FilmL.A. tracks primary and secondary ilming locations, primary and secondary locations for postproduction/visual effects (VFX) work, production spending and jobs. Of the 109 movies released by the Majors and Mini-Majors, reported production budgets ranged Research Analyst: from $1 million to over $300 million. 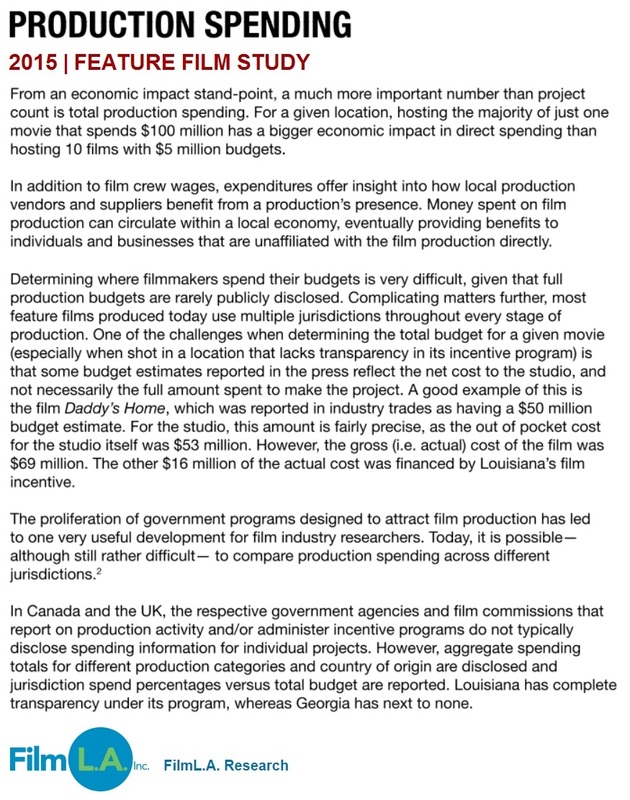 The average production Adrian McDonald budget in the sample was $67 million. The 109 ilms in this year’s study represent over $7 billion in direct production spending and tens of thousands of high-wage jobs in a wide array of professions. 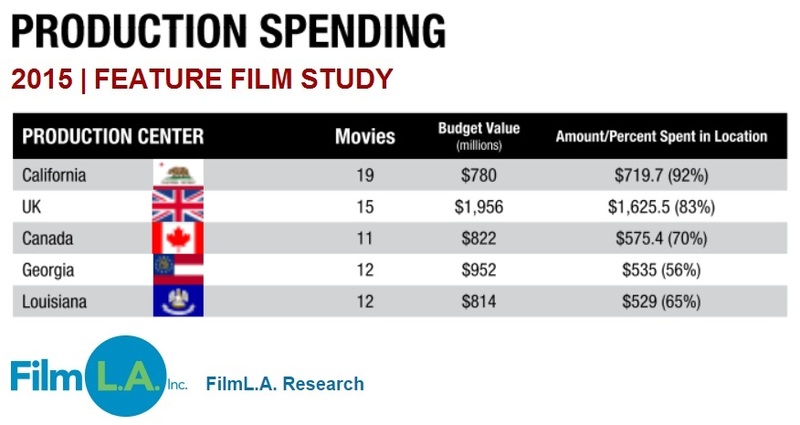 By comparison, the 107 movies included in the 2014 Feature Film Production Study had a combined production spend of $6.3 billion. 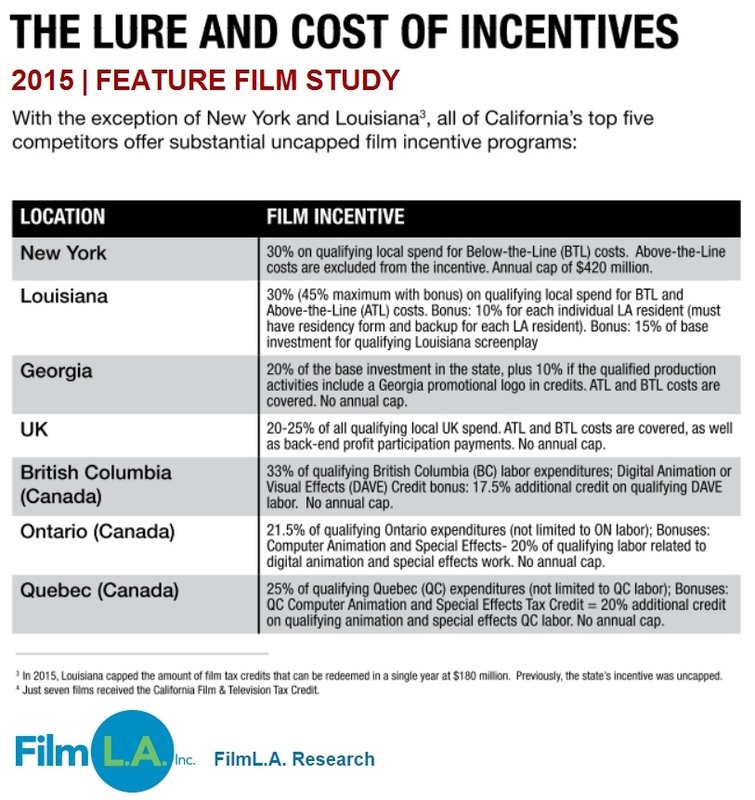 In competing locations like Georgia and the United Kingdom the film incentive programs cover both ATL and BTL costs. 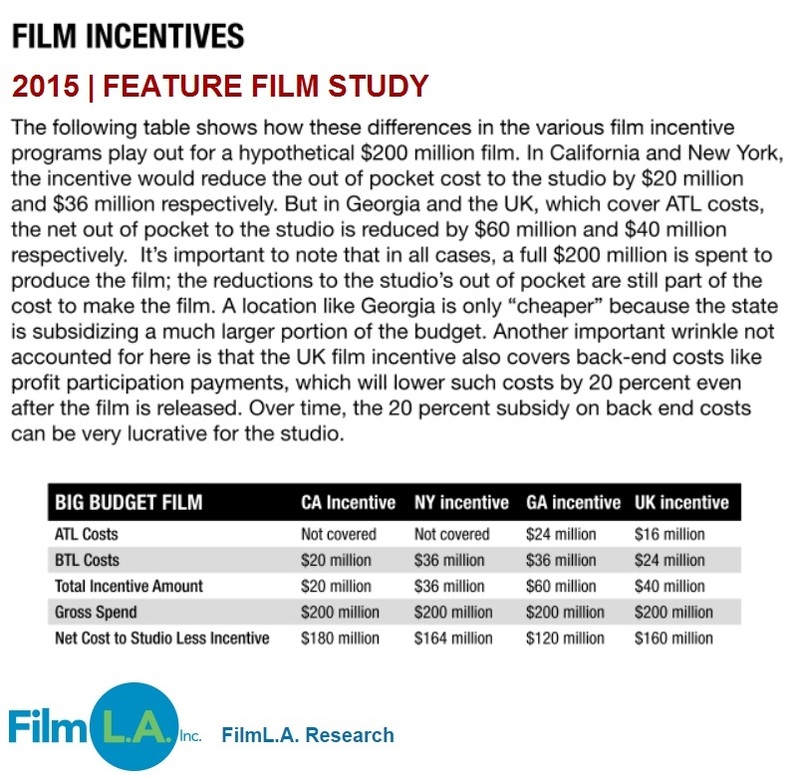 Under Georgia’s 30% incentive and the UK’s 20-25% incentive, a ilm that paid $10 million to an actor would receive $3 million or $2-$2.5 million in the respective locations. On average, ATL costs tend to represent 30-40 percent of the total budget, and sometimes 50 percent or more. Each year between January and April, Los Angeles residents observe a marked increase in local on-location ilming. New television pilots, produced in anticipation of May screenings for television advertisers, join continuing TV series, feature films and commercial projects in competition for talent, crews, stage space and sought-after locations. 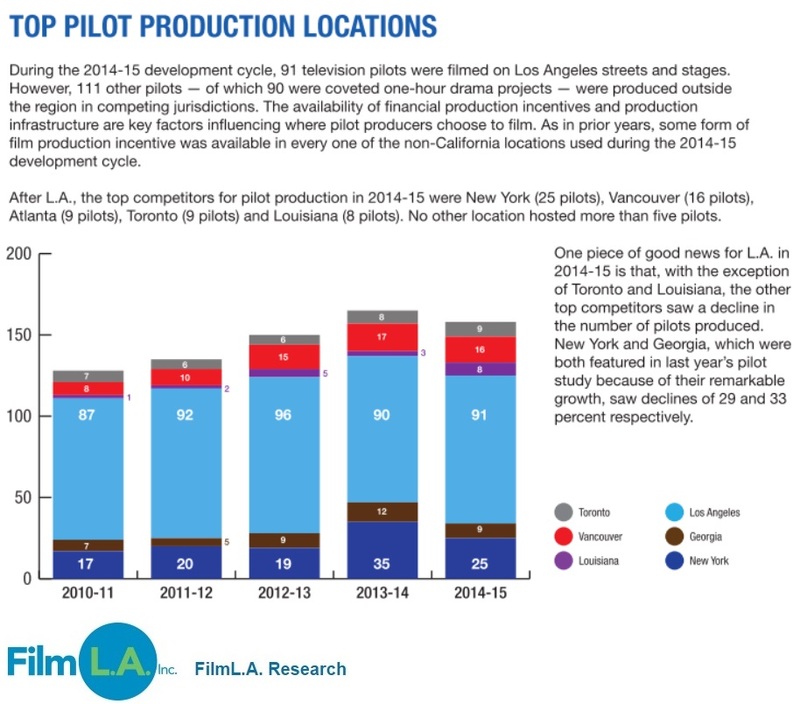 However, Los Angeles isn’t the only place in North America hosting pilot production. 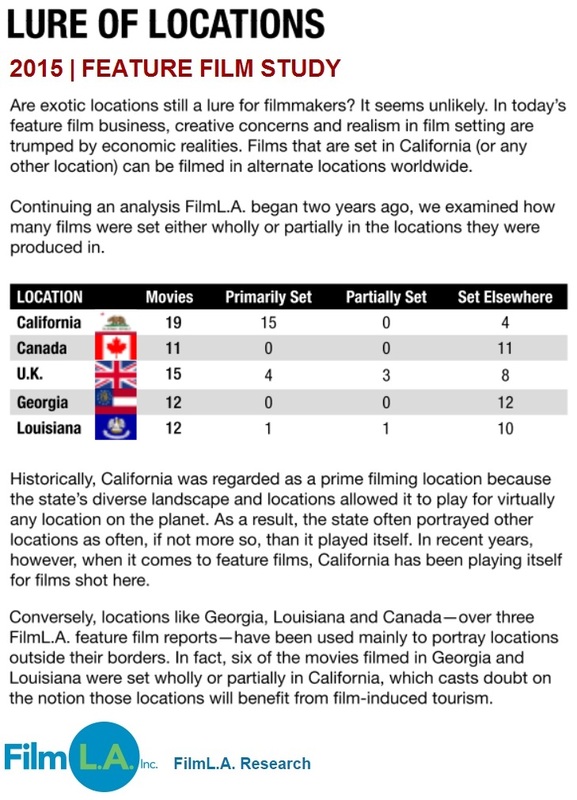 Other jurisdictions, most notably New York and the Canadian city of Vancouver have established themselves as strong competitors for this lucrative part of Hollywood’s business tradition. 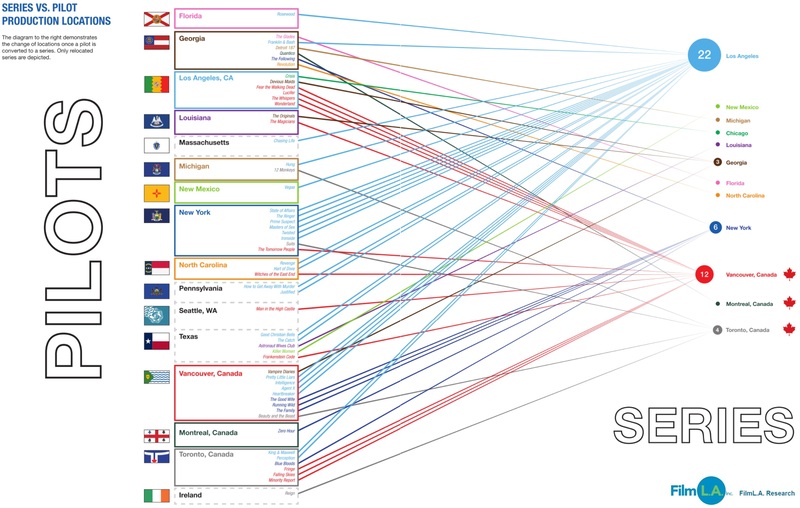 Below these top competitors is a second-tier of somewhat smaller players in Georgia, Louisiana and Ontario, Canada— home to Toronto. 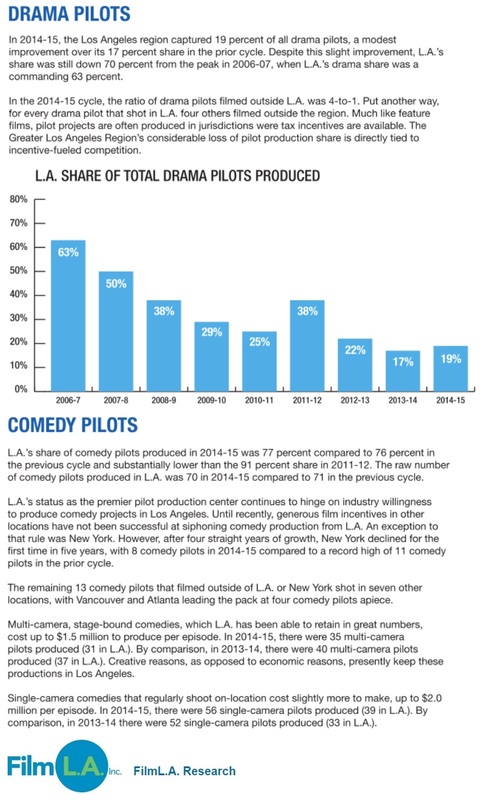 FilmL.A.’s oficial count shows that 202 broadcast, cable and digital pilots (111 Dramas, 91 Comedies) were produced during the 2014-15 development cycle, one less than the prior year, which was the most productive on record by a large margin. 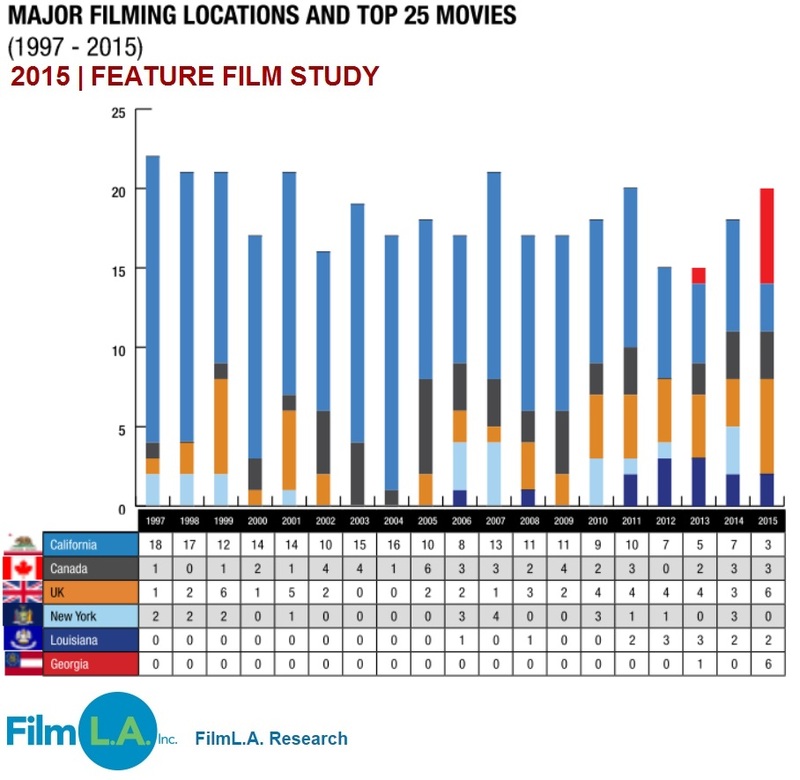 Out of those 202 pilots, a total of 91 projects (21 Dramas, 70 Comedies) were ilmed in the Los Angeles region. While this is the fourth largest annual tally in Los Angeles’ history, it was 10 fewer than L.A. handled during its peak year of 2004-05. 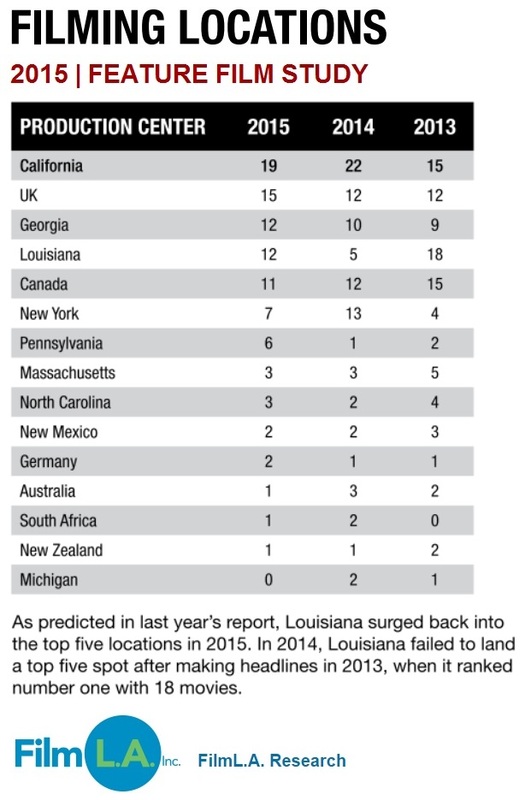 In terms of overall market share, L.A. captured just 45 percent of all pilots in the current cycle, marking the second year in a row that L.A.’s share fell below 50 percent. As of January 2015, North Carolina has implemented a new Film and Entertainment Grant program. Funds from the Grant will serve as a rebate of up to 25% on qualified expenses/purchases of productions. 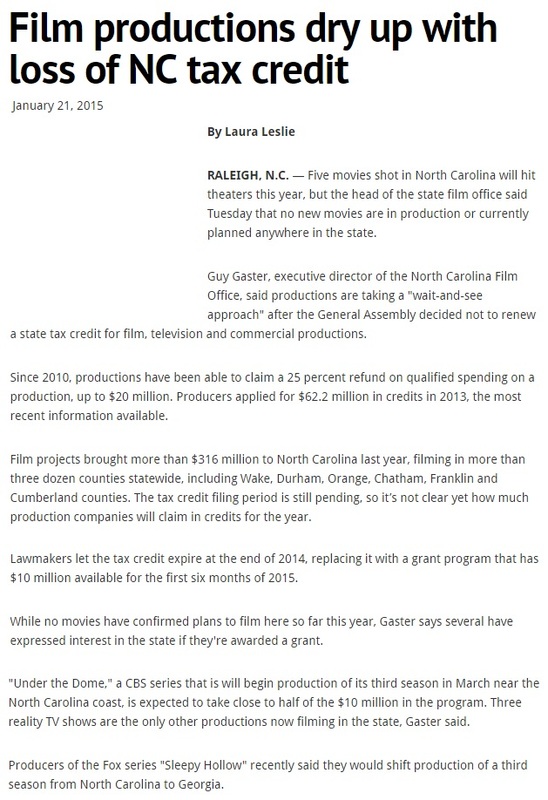 In September 2015, the North Carolina General Assembly, as part of the state’s budget that was signed by the Governor, made modifications to the NC Film and Entertainment Grant’s establishing statute increasing the amount of money available as well as making changes to the amount of in-state spending required by productions and maximum amount of funds that can be given per production. 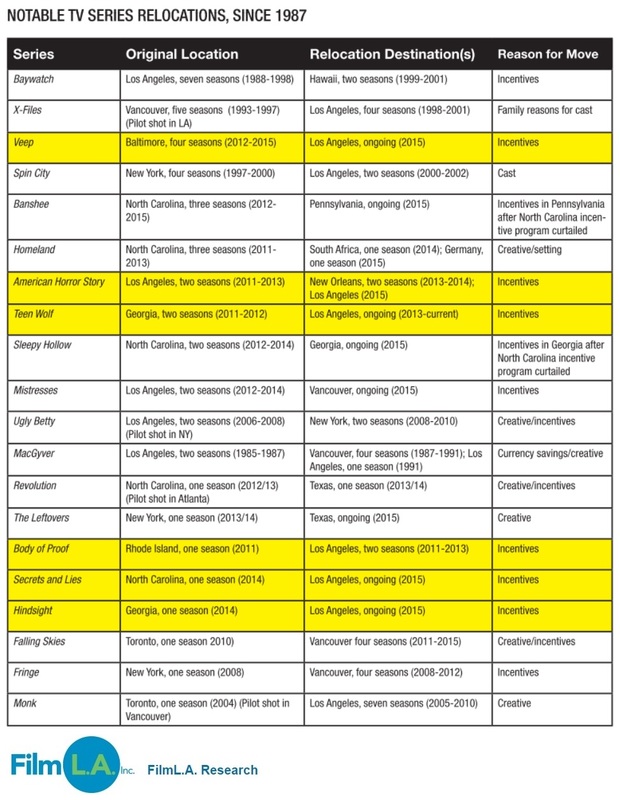 In 2000, North Carolina had competition from states that put money away to lure the film business. In 2005, the North Carolina General Assembly began an incentives program to keep up with the aggressive suitors. 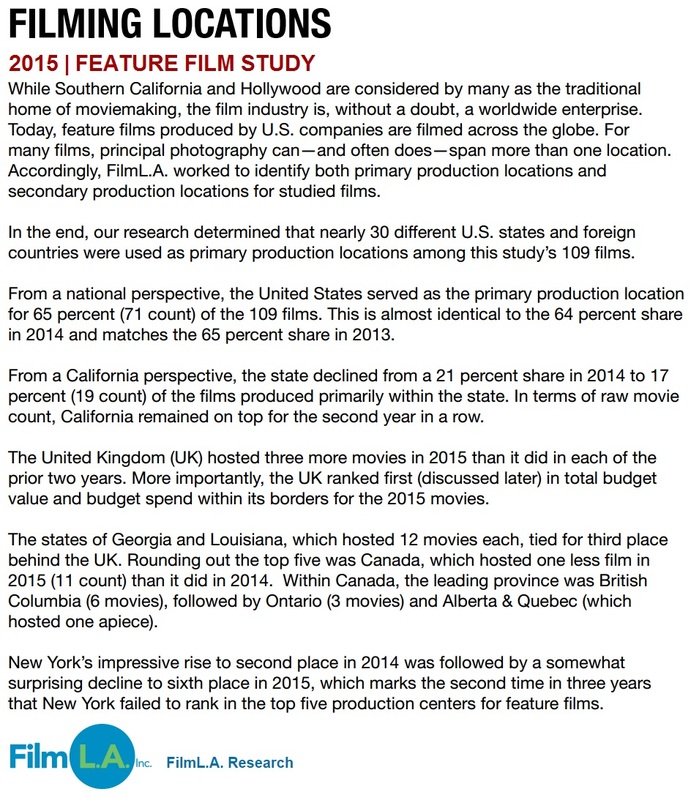 Halfway through the 2012 calendar year, film productions in North Carolina had already eclipsed 2011’s recording setting numbers for in-state spending. As of July, the North Carolina Film Office had received notification from more than 35 productions in regards to filming in the Tar Heel state that year. The projects created 15,000-plus job opportunities, including more than 3,300 well-paying crew positions for the state’s skilled film professional workforce. Much of the success of North Carolina’s film industry over the past two years is a result of bi-partisan legislation to enhance the state’s film tax incentive that was championed by then Democratic Governor Perdue and approved by the General Assembly in 2010. In 2014, after proponents of film incentives waged an intense debate, the N.C. General Assembly ended its 25 percent tax credits on spending and instead offered $10 million in grants. 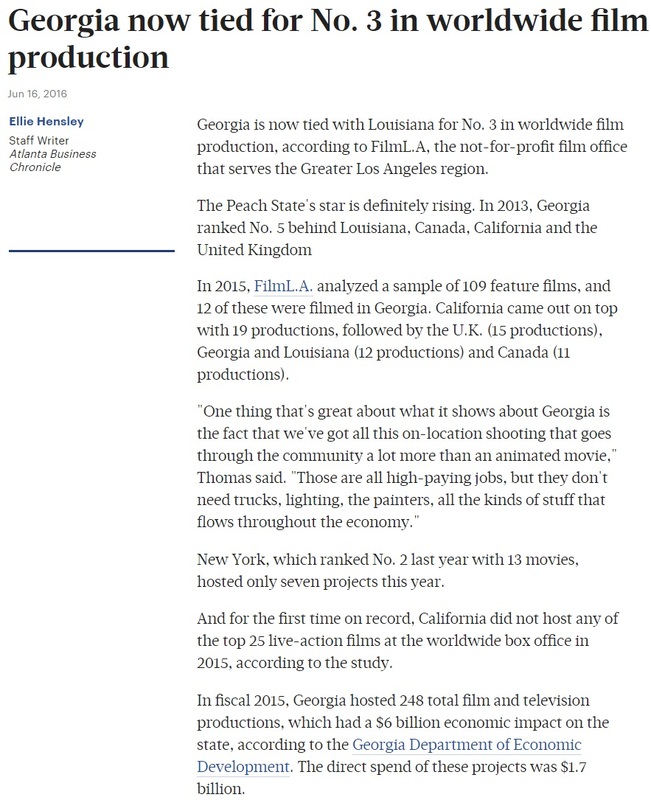 The N.C. film industry quickly left for Georgia and Louisiana, states that offered a lot more. 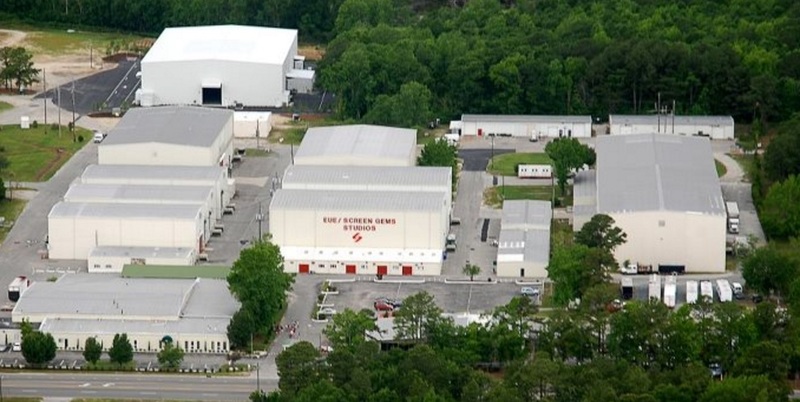 EUE/Screen Gems Studios in Wilmington, NC is the largest studio east of California. Since 1985, more than 400 film, television and commercial projects have shot on the 50-acre sound stage lot in coastal Wilmington, North Carolina. Films include “Iron Man 3” for Marvel and “The Conjuring” and “We’re the Millers” for New Line/Warner Bros. Recent television projects include “Under the Dome” for CBS, “Eastbound and Down” for HBO and “Sleepy Hollow” for Fox Television. More than 800 features have been filmed in North Carolina since 1980 including movies like: Nights In Rodanthe, Leatherheads, The Color Purple, Days of Thunder, Nell, Dirty Dancing, Forrest Gump, Shallow Hal, A Walk to Remember, The Divine Secrets of the Ya-Ya Sisterhood, Patch Adams, Last of the Mohicans, The Hunt for Red October, The Green Mile, The Fugitive, and Talladega Nights: The Ballad of Ricky Bobby. Television favorites such as Dawson’s Creek, One Tree Hill and Matlock have been shot here, along with pilots for the shows Hart of Dixie and Revenge.